Mumbai, murder and a baby elephant combine in a charming, joyful mystery for fans of Alexander McCall Smith and Rachel Joyce. On the day he retires, Inspector Ashwin Chopra discovers that he has inherited an elephant: an unlikely gift that could not be more inconvenient. 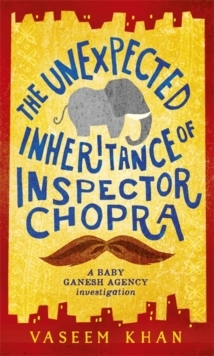 For Chopra has one last case to solve…But as his murder investigation leads him across Mumbai – from its richest mansions to its murky underworld – he quickly discovers that a baby elephant may be exactly what an honest man needs. So begins the start of a quite unexpected partnership, and an utterly delightful new series.